This sweet baby will be coming this spring. She or he will be welcomed even more than the blooming flowers! Welcome, welcome! They celebrated sweet baby Cash in wild safari style! I mixed zebras, elephants and giraffes with some large leaves to follow suit with the invitation! 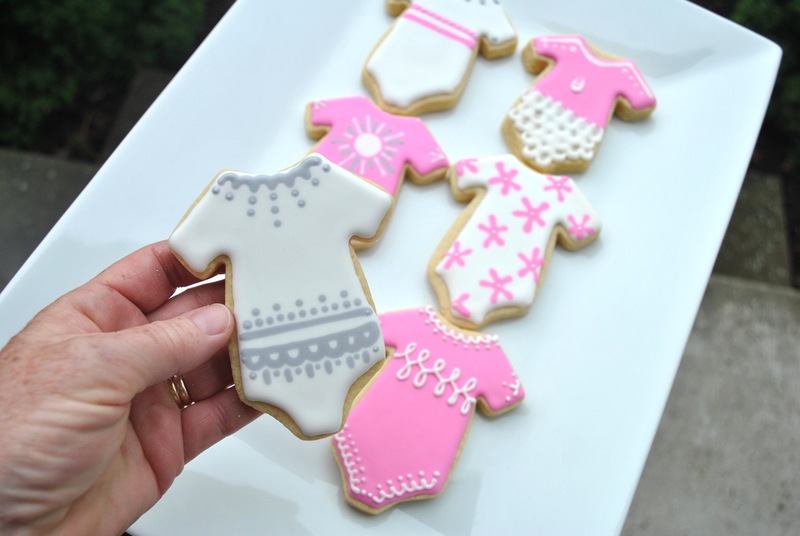 Playful and adorable is always a good match for a baby shower! Theodore R M was born on February the 11th! Happy, healthy babies are a great reason to celebrate! 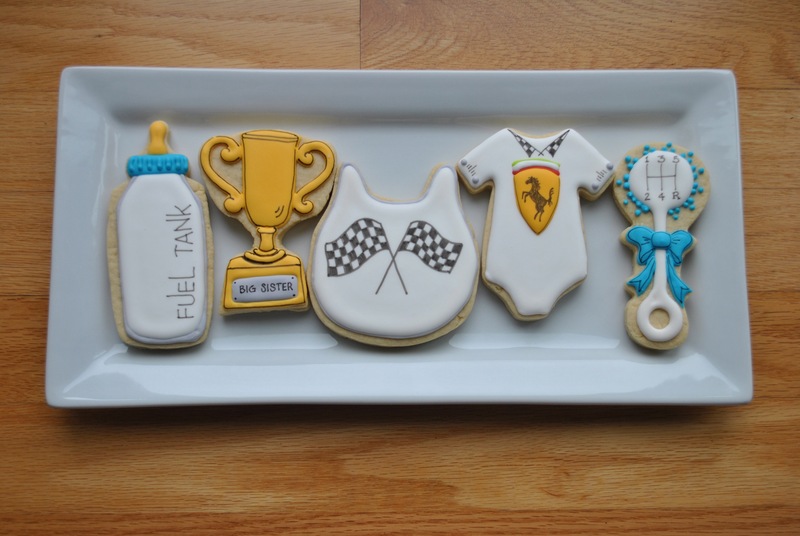 These cookies are for a bit belated baby shower celebrating Teddy (that’s what they are going to call him!). Naturally, a teddy bear theme was perfect for the occasion. I let that dry for 1 hour and added the arms, nose and feet. After drying overnight, I stippled the arms and added hands. Simple eye and nose details were added last, along with the rosy cheeks. The flower was made using wafer paper and a Martha Stewart (I think) Recollections punch (from Michaels). I painted them silver with a blue center (to match other cookie highlights ). Flowers were incorporated to match the invitation. The stencil airbrushed on the 2 other cookies can be found at Killer Zebras. There are some people in life that you just HAVE to admire. 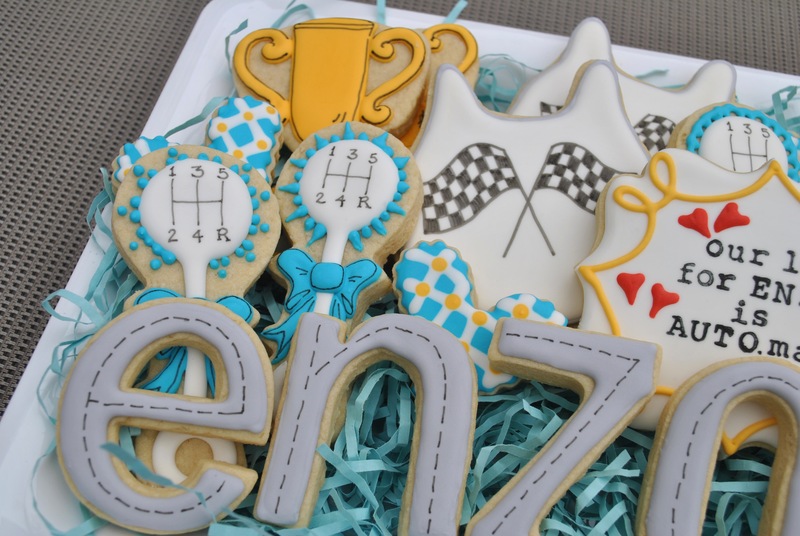 These cookies are heading to a baby shower celebrating the coming of their FOURTH boy! Holy testosterone! (As you can tell, we have a mere two children. And I was pretty happy to have the energy for them….). Blue and the number 4 were interwoven throughout the set. I added a little silver bling because everybody deserves a little bling (especially a mom of four!). The “4” cutter is part of the zebrawood cutter set from SheyB ! They have such fast and friendly service! 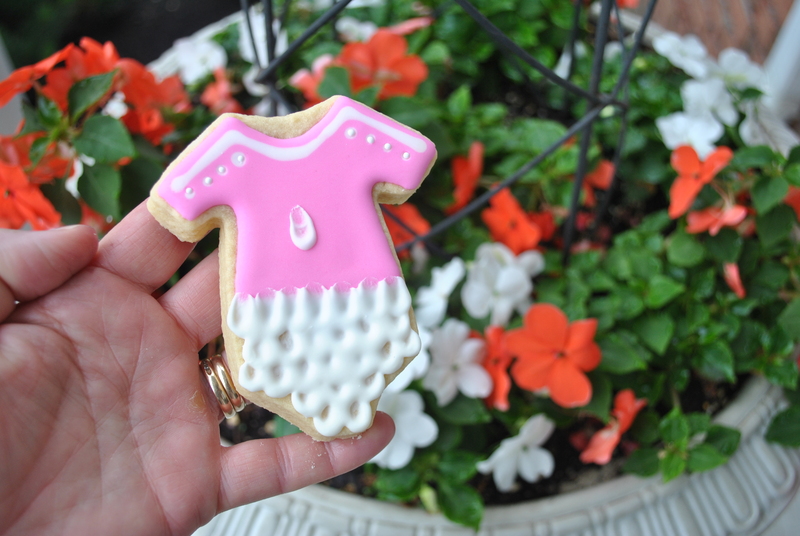 This little outfit cutter is my current favorite. Can’t get over how adorable it is. Thank you Kaleida Cuts (so many designs to take advantage of!)!!! The clever technique is from the genius Tammy Holmes. Utterly brilliant design. Utterly delicious eye candy. This set was made for a French teacher who is welcoming a little girl into their lives. The client wanted some french words; as I do not know French and sometimes question my English, I hope I got it right. The struggle is real. 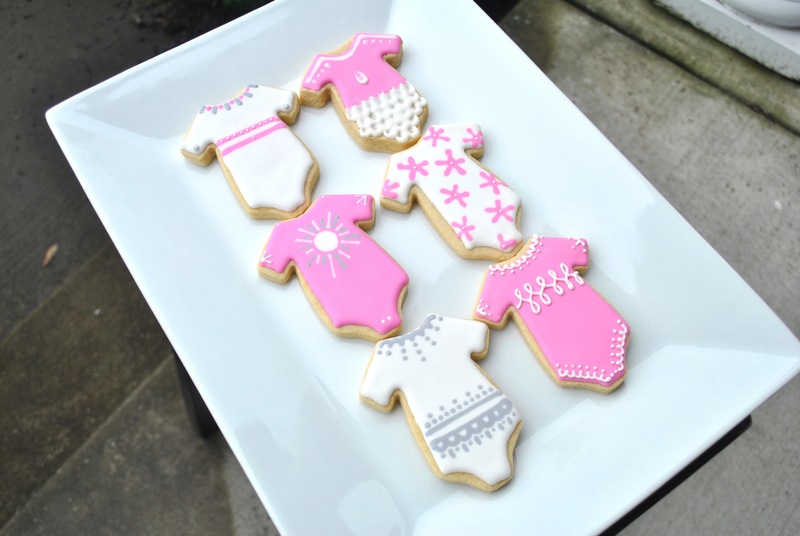 Just a quick post of some baby girl onesies I didi a while back. They were done in the ever popular pink, grey, and white theme. It’s always about the story… Long ago, the parents vacationed in Italy and got to tour the Ferrari auto factory. As they heard the whole story, they fell in love with the name Enzo. 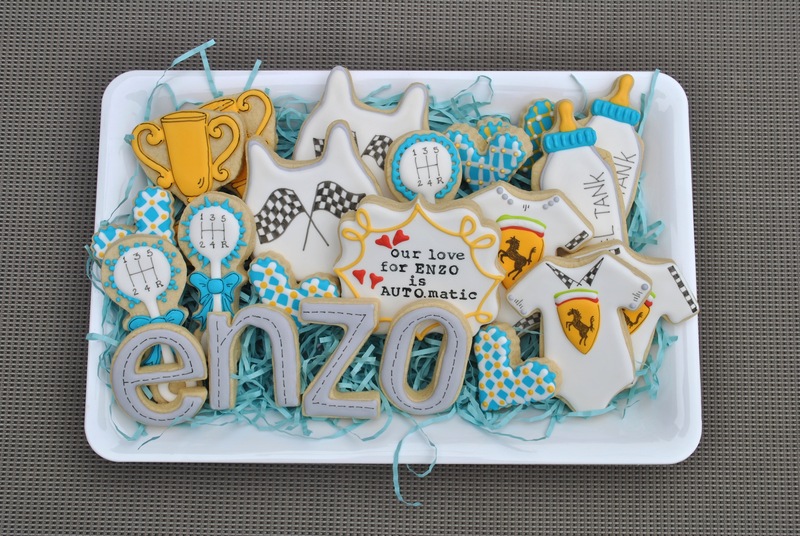 Two lovely little girls later, along comes their beloved Enzo… aaaand the car and driver themed baby cookie set. I hope Enzo Ferrari would be proud. PS: Everyone should learn how to drive a manual transmission. So much fun. Really, really.